We’d love your help. Let us know what’s wrong with this preview of By Moonrise by Jackie Dana. In Sarducia, magic is real—at least for now. Kate Norton isn’t prepared for a debate about magic. All she wants is to keep her job. But when the silver ring she just inherited suddenly drops her into this mysterious, archaic land, her priorities quickly change. For magic is what lies at the heart of a political rivalry threatening to tear Sarducia apart. Even as Kate tries In Sarducia, magic is real—at least for now. For magic is what lies at the heart of a political rivalry threatening to tear Sarducia apart. Even as Kate tries to figure out why she ended up in Sarducia, she gets pulled into the conflict. Unwilling to be a passive bystander to unfolding events, Kate forges her own path, using instinct to decide who she can trust, and rebuffs those who try to manipulate her. Driven by loyalty and love, Kate takes dangerous risks with far-reaching consequences. Will her efforts be enough to save herself and her friends? To ask other readers questions about By Moonrise, please sign up. A Fantastically creative world about a young woman named Kate and her adventures in Sarducia. This was certainly a page turner that I could not put down. I am looking forward to the next book in the series. By Moonrise is the first novel by Austin author Jackie Dana. It follows the adventures of ordinary Kate Norton, who finds herself transported to a strange world after inheriting her mother's ring. Sarducia may seem like a medieval Europe at first glance, but it is a different world entirely. For starters, magic is not only very real, but a bit of a political issue. Everything seems to be a political issue, actually, as Kate finds herself sucked into the turmoil of a country dealing with religiou By Moonrise is the first novel by Austin author Jackie Dana. It follows the adventures of ordinary Kate Norton, who finds herself transported to a strange world after inheriting her mother's ring. Sarducia may seem like a medieval Europe at first glance, but it is a different world entirely. For starters, magic is not only very real, but a bit of a political issue. Everything seems to be a political issue, actually, as Kate finds herself sucked into the turmoil of a country dealing with religious and regal unrest. Figuring out how and why she's in Sarducia, and how to get home, might have to take a backseat to survival. 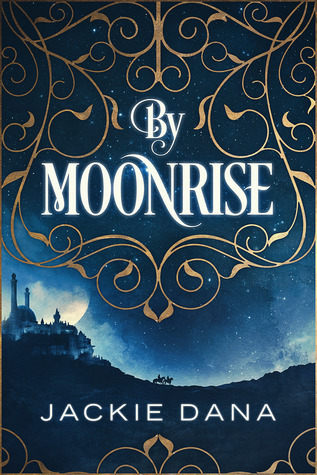 As you might guess from that description, By Moonrise is a fantasy adventure story, complete with political intrigue, magical doings, and a dash of romance. I'm a bit torn on how to review this, honestly. On the one hand, I liked it. It was entertaining enough for an easy ready, and some of the supporting characters were nicely nuanced and interesting. I would genuinely pick up book 2 to see what happens. On the other hand, there were a lot of issues with it. Kate as the heroine mostly fell flat for me. The book blurb here on Goodreads led me to believe she would be feisty and stubborn, but more often than not she just let herself be dragged or sent from one place to another by whoever she was with at the time. And I found her follow-through on demanding answers disappointing. She was not proactive enough for me, and didn't really do much over the course of the book. Aside from that, reading this sometimes felt like going down a Fantasy Novel Checklist. Weird words for royal titles? Check. Obvious romantic interest-to-be? Check. Haven't had a swordfight yet, so let's put one here? Check. Kate discovers her heritage isn't what she thought it was? Check. It wasn't boring, and I realize a lot of this is just genre standard, but it made the story predictable in many ways. I was unsurprised by both of the reveals at the end. Very good story! The action never stops and the description is rich. As you read, it seems a switch is flipped and a story that is already moving along, speeds up and rockets to the end. I didn't expect the twist at all! Well done! I also liked that the reader learns of this land's history along with Kate. Sometimes authors tell the reader too much about things like that, Dana allows us to stumble along with Kate rather than be the omniscient reader.! It had a slow start . It seems like a great start of a epic fantasy novel. With a dash of romance and court intrigue. Look forward to the next book. I'm a sucker for stories that involve hapless travelers moving between worlds. This book has everything from political intrigue to adventure to romance. I had a little trouble getting into it at first, but once it hooked me I read it obsessively until I finished. Dana's Sarducia is a richly nuanced world that I enjoyed reading about. It's clear that a lot of thought and world building went into this book. What's more, her characters popped off the page like living, breathing people. I'm eagerly a I'm a sucker for stories that involve hapless travelers moving between worlds. This book has everything from political intrigue to adventure to romance. I had a little trouble getting into it at first, but once it hooked me I read it obsessively until I finished. This is a delightful read. There's love, mystery, and a medieval type political system that's rife with intrigue. Kate is a marketer grieving her mother's death when voices start beckoning to her. One stormy night the ring her mother gave her begins to glow, and she steps in to find herself in a world wholly different from her own. As someone unfamiliar with the land of Sarducia, she's thrown into the middle of royal affairs, and finds herself caught between a whole cast of characters who are wor This is a delightful read. There's love, mystery, and a medieval type political system that's rife with intrigue. Kate is a marketer grieving her mother's death when voices start beckoning to her. One stormy night the ring her mother gave her begins to glow, and she steps in to find herself in a world wholly different from her own. As someone unfamiliar with the land of Sarducia, she's thrown into the middle of royal affairs, and finds herself caught between a whole cast of characters who are working their own agendas. Rynar - the king's right-hand man, takes her under his wing, and her path keeps bringing her into the presence of Arric, the king's brother who is rumored to have killed his father and abandon his people. Oh yes, and there's magic, though the religious group known as the Sarnoc don't really consider it to be magic, using it for healing and mild manipulation of the elements. Disclaimer: I received this book free for an honest review. I gave Ms Dana five stars with this caveat: I thought it better than a four, closer to a four and a half, but that was not doable and rather than degrade the rating it got a little of an elevation. I hope readers of this review will understand. After a slow start from over description in her desire to build a world and characters, (not uncommon with first novels) the plot comes alive with a potential love triangle that just never seems to Disclaimer: I received this book free for an honest review. After a slow start from over description in her desire to build a world and characters, (not uncommon with first novels) the plot comes alive with a potential love triangle that just never seems to resolve until the end of the story with a nice twist. The characters are well created and fleshed out in a setting with a medieval feel. Kate, the main character, adapts well to the change in worlds and culture, though with trepidation. One can almost feel her angst as she tries to understand what transpired, much as did John Carter in Edgar Rice Burrough's Mars series, or Hank Morgan struggled in Mark Twain's masterpiece, "A Connecticut Yankee in King Arthur's Court." GAB I received a Kindle copy of this Si-Fi novel from Jackie Dana in exchange for an honest review. Thank you Ms. Dana for sharing your hard work with me! Jackie Dana has imagined us a wonderful world, populated with likable, deeply drawn people, that it is a pleasure to visit. I love the way she presents hints and clues to the nature of her world, and loved the characters that wandered through this tale. Kate is a modern girl, lost in mourning for her recently passed Mom. Her 'trip' to Loraden i GAB I received a Kindle copy of this Si-Fi novel from Jackie Dana in exchange for an honest review. Thank you Ms. Dana for sharing your hard work with me! Jackie Dana has imagined us a wonderful world, populated with likable, deeply drawn people, that it is a pleasure to visit. I love the way she presents hints and clues to the nature of her world, and loved the characters that wandered through this tale. Kate is a modern girl, lost in mourning for her recently passed Mom. Her 'trip' to Loraden is handled well, and the descriptions of people and places are intense. I cannot wait for the publication of her next tale, The Hidden Moon.